World-Class Deals at the World Series: What is it about Right Field? Seats are becoming scarce at the Rangers Ballpark in Arlington, TX, as the Giants go on the road this weekend, but it’s still possible to grab one for a good price. Here’s a look at the most reasonably priced World Series tickets according to the SeatGeek Deal Score calculator, which uses historical data and the angle to the field, among other factors, to assign each ticket listing a ranking out of 100. The better deals show up as bigger, greener, circles on the map. 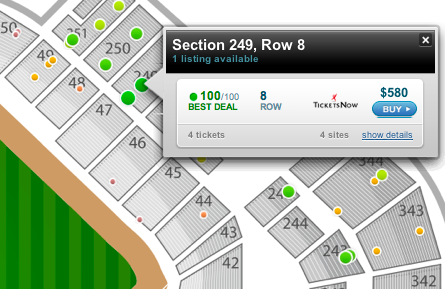 The deals on Saturday’s game are concentrated out in right field. The best deal score (a perfect 100/100 in Section 114, Row 38 for $812) and cheapest ticket, $519 in Section 310, Row 16, are by the infield. On the Halloween day game, right field again boasts the most deals. 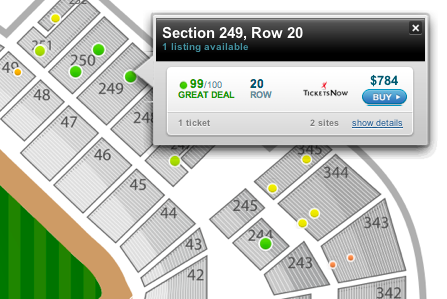 This time it also has the best deal score seat, for $580 in Section 249, Row 8, and a $464 ticket in Section 344, Row 19. If the Giants and Rangers are still duking it out on Monday, right field will again be the best place to find last minute tickets for cheap. 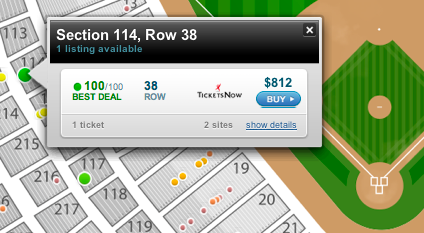 As of Friday afternoon there are 25 SF Giants tickets in $400-500 range. 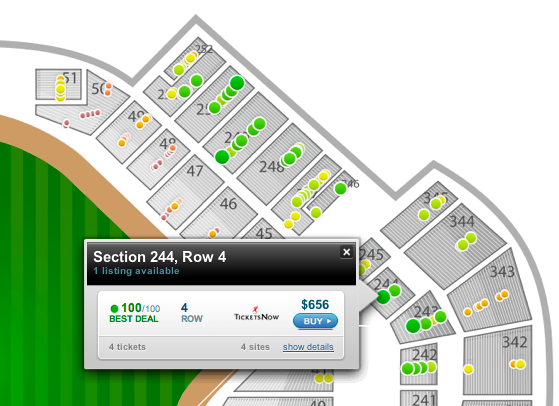 The map below highlights one of two perfect deal scores, a $656 seat in Section 244, Row 4. What is it about right field that’s such a steal? SeatGeek isn’t sure. Have an idea? Post in the comment box below or reach out to us on Twitter @SeatGeek.